The boom in craft beer means there are more places than ever to enjoy your favorite brew, as we found out in part one of our four-stop craft beer tour. The sheer diversity of venues now selling craft beer shows its broad-ranging appeal. So in part two, we continue the quest. This time around, we explore District 2, which was once swampland, but which now has international-standard bars and restaurants—some of them by the river. We also find a newly opened steakhouse that serves craft beer, and a breezy venue in District 3’s cafe quarter. To finish, we check in with a brewhouse at their newest venue where they stock one of the largest selections of craft beers, both in-house brews and craft beers from other local breweries. Our first stop is Gon & Nhe. This breezy open-sided bar opened in October 2017 is opposite the Sila Urban Living residence. 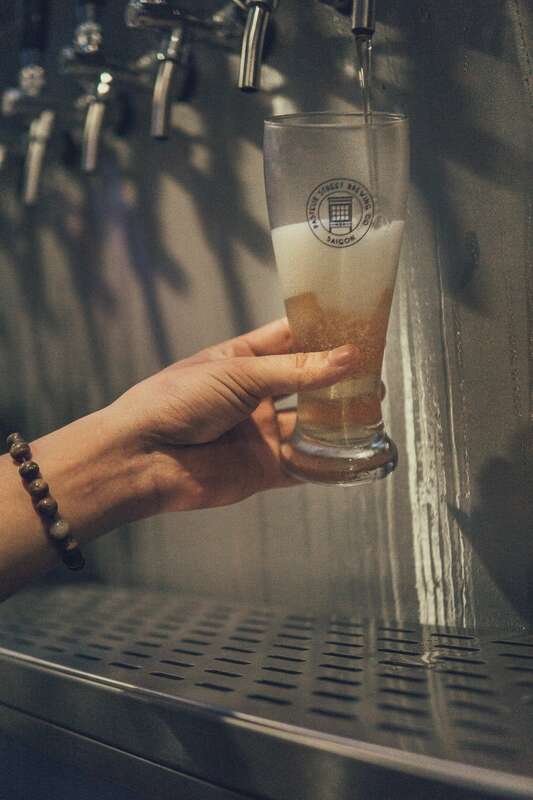 But Gon & Nhe’s craft beers attract many more locals than international guests—which is true of this part of District 3 in general—just visit nearby music bars like Acoustic and Yoko Cafe for proof. This breezy open-sided bar opened in October 2017 is opposite the Sila Urban Living residence. Naturally then, at Gon & Nhe, light and refreshing craft beers are popular. “I’d choose the Heart of Darkness Loose Rivet New England IPA,’” Gon & Nhe’s manager, Tony, nods, as he sits two bottles down on the table. Customers looking for something slightly more adventurous ask for this beer which is 7.5% ABV and has 59 IBUs because New England IPAs are flavorsome without being too bitter. A glass of Heart of Darkness: Loose Rivet New England IPA with Gon & Nhe’s specialty – ‘custom peanuts’ is definitely your best choice. As motorbikes slowly buzz past on Ngo Thoi Nhiem, Tony opens the beers besides a bowl of their custom peanuts “with garlic, chilli, and salt” made specially for Gon & Nhe. 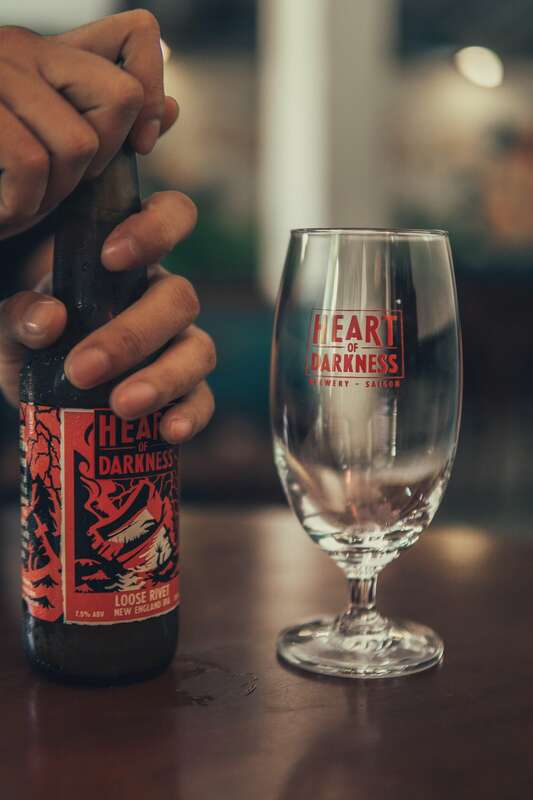 “Heart of Darkness are very serious about their craft. And this is a very decent beer,” he explains as we take a sip of the cloudy ale. “It has a lot of body and charisma,” the equally charismatic bar manager smiles. Tony, Gon & Nhe’s manager chose the Heart of Darkness Loose Rivet New England IPA for his favorite brew. The bar: Gon & Nhe serve craft beer to devoted locals at their District 3 beer house. The beer: The flavorsome but not too bitter Heart of Darkness Loose Rivet New England IPA. 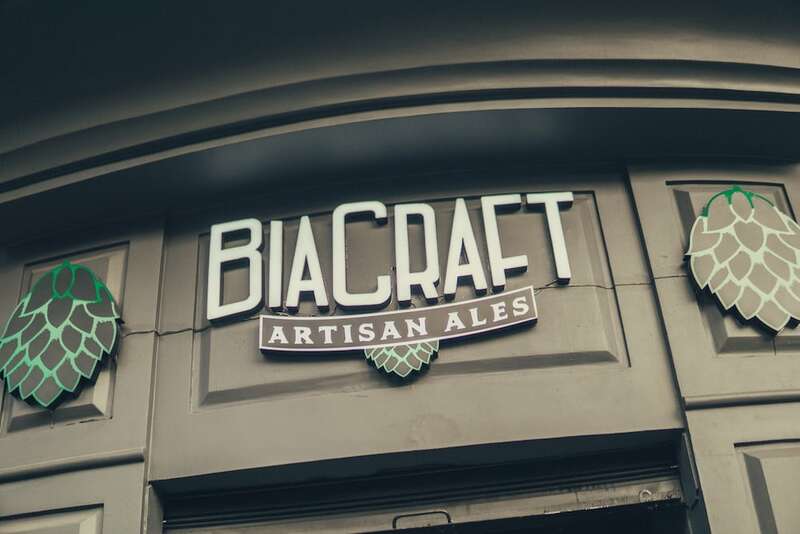 Next we head towards Ben Thanh Market to visit the newest branch of BiaCraft Artisan Ales. 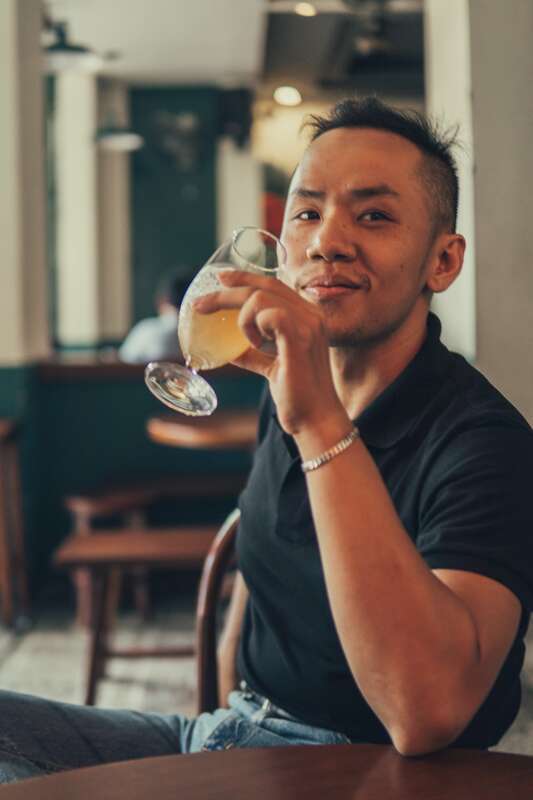 Although BiaCraft stocks the most extensive selection of craft beers in the city, BiaCraft’s manager, Khanh Duy Nguyen, chooses one of their own brews, the Cởi đồ ra (Let’s get naked) Wildberry Wheat Ale, for us to try. BiaCraft Artisan Ales lies on Nam Ky Khoi Nghia street, near Ben Thanh market. This Nam Ky Khoi Nghia branch has only been open a month. 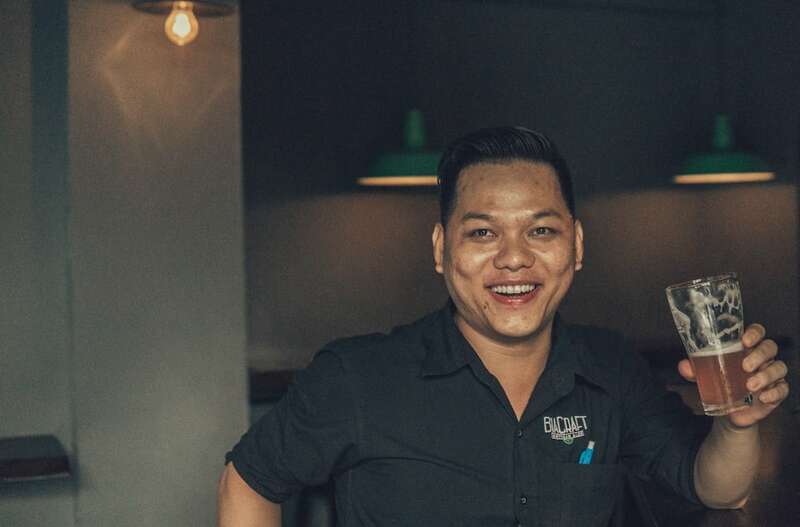 It joins BiaCraft’s three other locations in the city, the two neighborhood hangouts at 1 Le Ngo Cat in District 3 and 90 Xuan Thuy in District 2, and their canalside venue at 300 Truong Sa. BiaCraft Artisan Ale’s Cởi đồ ra (Let’s get naked) Wildberry Wheat Ale is 4.0% ABV and has 16 IBUs. BiaCraft Artisan Ale’s Cởi đồ ra (Let’s get naked) Wildberry Wheat Ale is filled with refreshing berry flavors. The bar: BiaCraft’s newest location on Nam Ky Khoi Nghia is a short walk from Ben Thanh with a corner location perfect for people watching. The beer: BiaCraft Artisan Ale’s Cởi đồ ra (Let’s get naked) Wildberry Wheat Ale is filled with refreshing berry flavors. We decide to take a trip over the river into District 2 to The Boathouse. Open since 2007, the restaurant and bar is something of an institution, not that they’re resting on their laurels. They’ve recently switched up the menu and are refining it again. Open since 2007, The Boathouse is something of an institution, not that they’re resting on their laurels. They now stock a broad selection of craft beer. 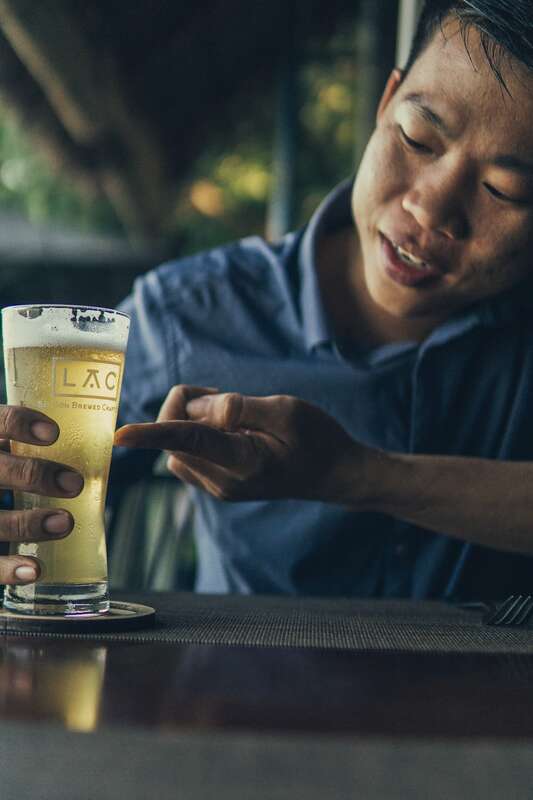 Assistant manager Vien Nguyen recommends we try the LAC Mango IPA. Inspired by the tropical flavors of Vietnam, the LAC Mango IPA is the brand’s flagship brew. The hazy golden beer features distinctly ripe mango flavors with a hoppy finish. Perfect for an early evening by the river. 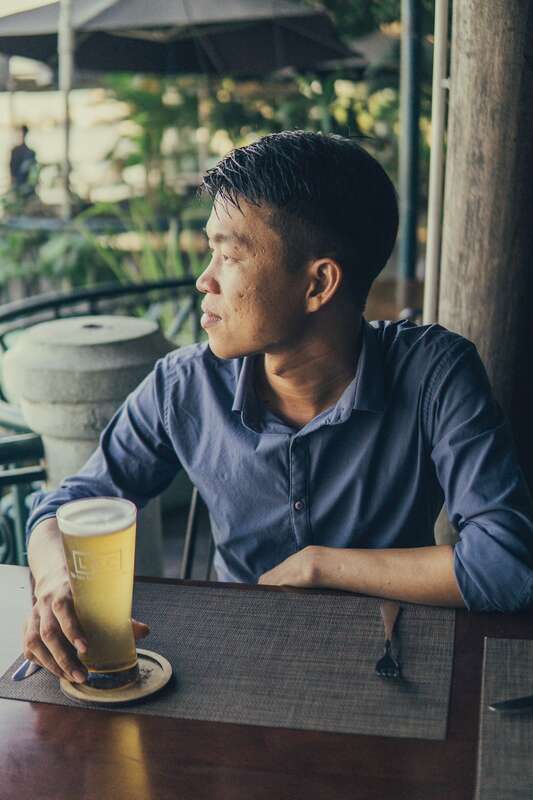 Assistant manager Vien Nguyen recommends we try the LAC Mango IPA. 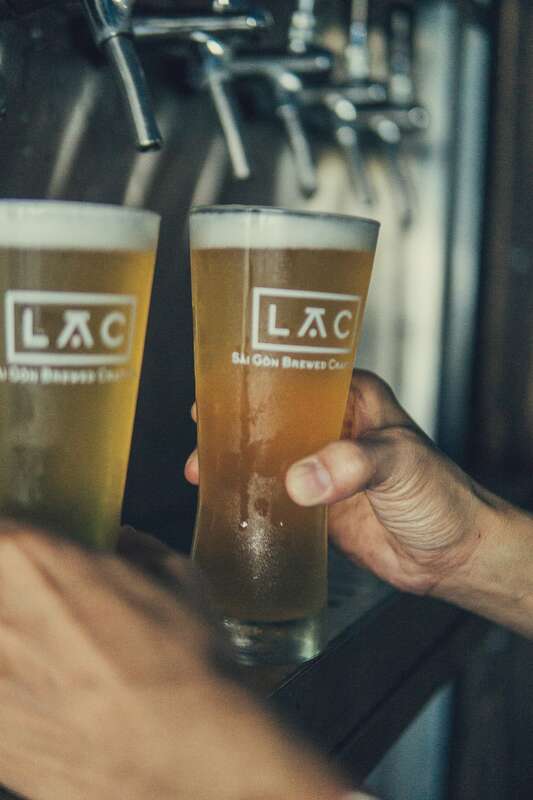 “We’re really happy to represent smaller Vietnamese craft brewers like Lac Brewing Co.,” Vien Nguyen explains. “And I think this is a very good craft beer,” he smiles after taking a sip. Inspired by the tropical flavors of Vietnam, the LAC Mango IPA is the brand’s flagship brew. The bar: The Boathouse is an institution by the river in District 2. The beer: The Lac Brewing Co. Mango IPA has lots of ripe fruit flavor in a hop-forward craft beer. 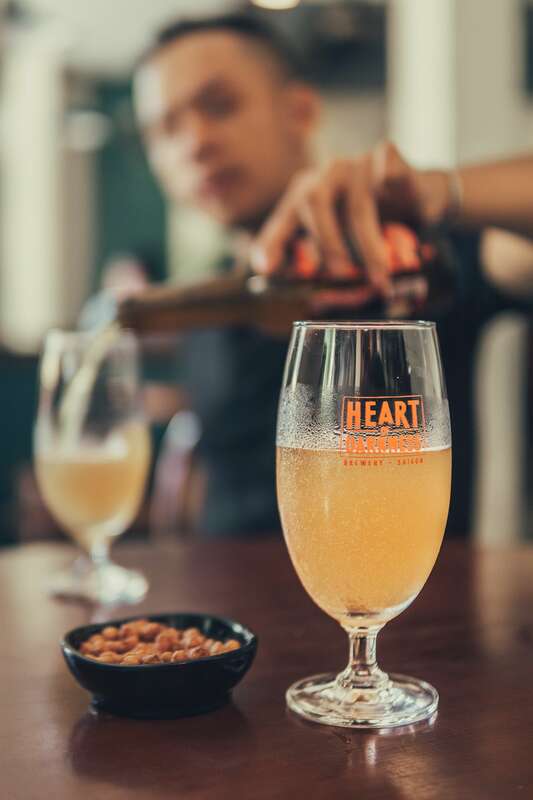 To understand how ingrained into Saigon’s food and beverage culture craft beer has become we drop into Ussina, our last stop on our second craft beer venue hop. This modern steakhouse and bar have recently opened opposite Trois Gourmand on District 2’s Tran Ngoc Dien. And this is Saigon’s first outlet of the Japanese chain. Ussina, our last stop on our second craft beer venue hop. Inside, the decor is that of a macho steakhouse, with red furniture and steel fittings. Chefs busy themselves in the open kitchen, but we’re more interested in the craft beer being served from their small kiosk in the yard. Their manager suggests we try the Pasteur Street Spice Island Saigon. It fits the mood for this over-the-river location. The Pasteur Street Spice Island Saison is heavily carbonated and spicy—like any self-respecting saison. 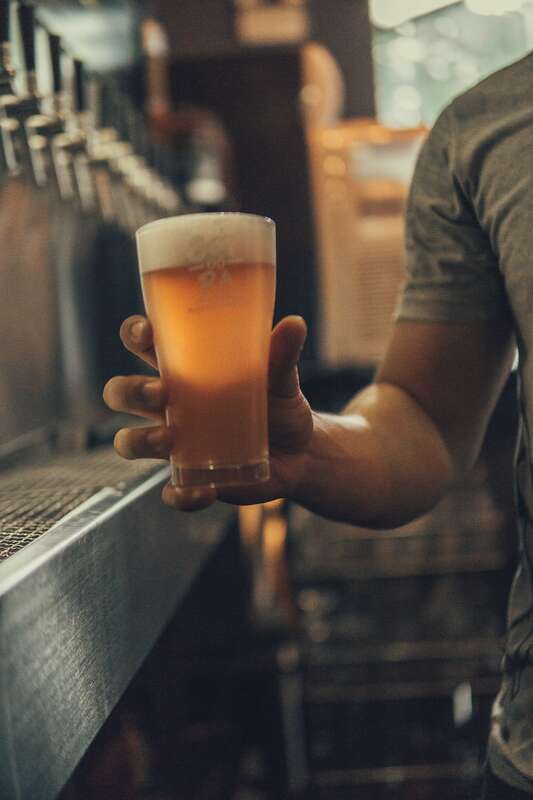 Pasteur Street have always looked to incorporate local ingredients into their craft beer. Today they’ve produced around 200 beers imbued with that spirit of mixing American brewing techniques with local flavors. 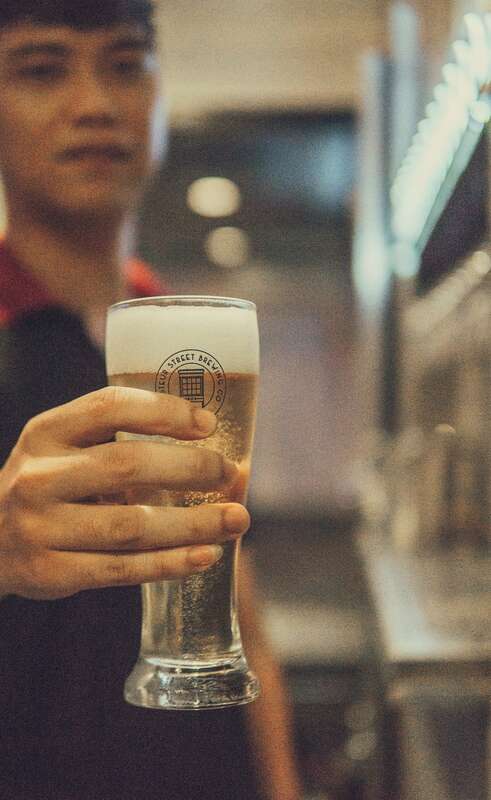 They’re available at their tap rooms—like the original one on Pasteur Street which gave them their name—and 200 outlets nationwide. Like many saisons, Pasteur Street’s Spice Island Saison is a sparkling pale ale with spice and herb notes. And while saisons are usually light, modern versions come in much stronger. This one finishes at 7.2% ABV and 23 IBUs. The bar: Ussina Aging Beef and Bar is the first Vietnam location for this Japanese restaurant and bar chain. The beer: The Pasteur Street Spice Island Saison is heavily carbonated and spicy—like any self-respecting saison. Location: 38 Tran Ngoc Dien, District 2. Previous articleDemystifying Craft Beer: What’s An IPA?